There was a time when Rudy Giuliani was in so tightly with a fanatically anti-Hillary faction of the FBI in the Albany field office, he went on cable news and bragged in advance that the agents were about to sabotage the election against her. Since that time he’s largely been avoiding the spotlight, even while getting himself in legal trouble. Now he’s surfacing, for some reason, just so he can admit how scared he is of the FBI. Giuliani’s prior bragging about his FBI insider information made him politically radioactive, ultimately costing him a Trump cabinet position because he never would have made it through Senate confirmation hearings without having to answer for it. Later he surfaced as a legal adviser for a Turkish guy named Reza Zarrab, who was on trial in the United States. Giuliani tried to sabotage the trial, prompting the judge to chase him away. Later, Zarrab cut a plea deal which very much appeared to be closely related to Michael Flynn’s plea deal against Donald Trump. Giuliani then went dark again, until today. Now, for reasons known only to him, Giuliani is suddenly using a Washington Post article to publicly warn Trump and the Republican Party. He’s saying they “must be careful” about screwing with the FBI (link). He then goes on to insist that the FBI somehow rigged the election for Hillary Clinton, which is laugh out loud hilarious, considering that Giuliani plotted with a faction of the FBI to illegally rig the election for Donald Trump. But the big question here is why Rudy Giuliani is suddenly surfacing now, so he can bitterly complain about the FBI while wearily and warily warning his allies not to screw with them. What has the FBI done to him in the past year? We’ve long suspected that when Zarrab cut a deal, he didn’t just flip on his Turkish co-conspirators; he flipped on Giuliani as well. 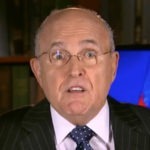 Giuliani now sounds like a scared man who’s been broken by the Feds. Has he been forced to cut a deal against Trump?